I’ve looked at this and looked at this. I’ve turned it sideways and upside down. I’ve put it away and come back to it later . . . three times. Now I need someone to tell me exactly what these people are doing. I assume it’s a game and I think it uses a ball. Although I can’t see a ball, the lefty in the front right seems to be throwing something. Someone has obviously spent significant time laying out the court, or whatever you call it. It looks like the 70s here, or maybe early 80s. Was this a thing? Is this still a thing? I have no earthly idea, but am very curious — will you follow up with the answer? Thanks! It looks like the layout for throwing events in track and field: discus, hammer, shot put, and javelin. Maybe the people are the spear catchers. Actually, they would be spotting the where the object first landed, ignoring bounces. There should be a long tape measure somewhere, there might be one laying out unrolled in the shadow. I don’t know what the concentric circles near the tower are for. Discus warmup? I’d look to see if there was a inter-college olympics of some sort. Maybe an olympics year? That looks like the residential portion of Baker old dorm, photo taken from Lovett. I Googled sport field set up, and for Javelin, Discus and Shotput it’s always concentric circles at the axis of a prescribed angle or set of angles. The position of the fellows along the bottom of the picture do seem to be in the correct positions for spotters and the fellow who seems to be throwing something is in the correct position for a retriever. However, the concentric circles on the side are a mystery. It seems a rather small field. Maybe it’s for some special Beer Bike-like activities…the pencil throw…the frisbee throw…the rubber ducky toss? There does seem to be a stake, perhaps with plastic flags in the center of the circle. That was fun…will watch for more info on this! Thanks. Melissa, Looks like shot put to me. The first circle is about 40 ft from the putter. The ring at the putting position is hard to see but looks about dimensionally correct. 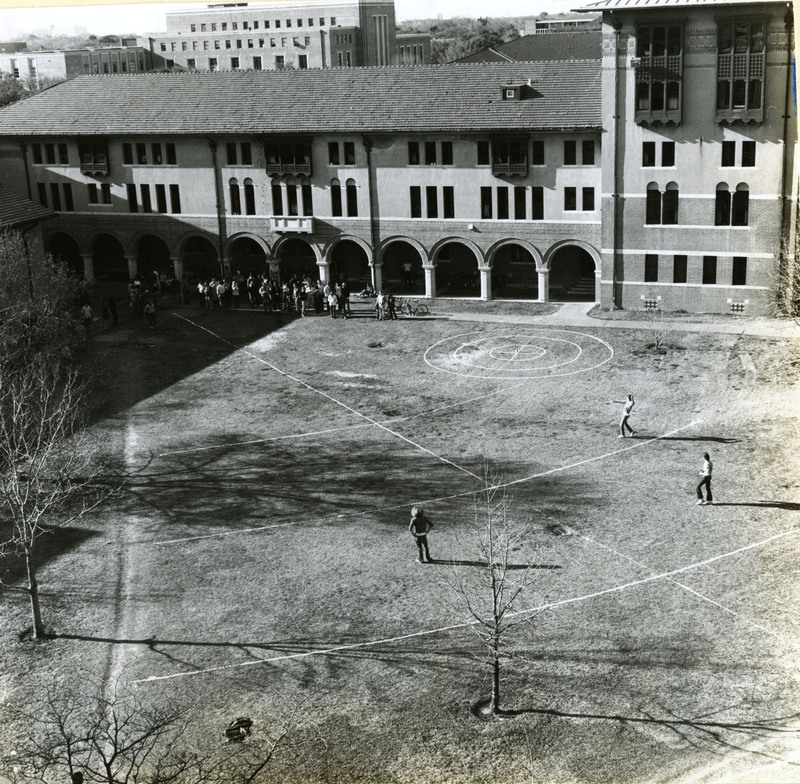 The student standing near the circle looks as if he is ready to put the shot. Also the ground appears to have several pock markts that look as if they were made by an object the size of a shot. I have no idea what the concentric circles are all about though. Long sleeves, so it isn’t one of the warmer months. The pose of the person on the left in the white shirt just shouts “Keith Robinson” to me. Two kids with the adult in front of the bicycles. Maybe the circular area was for Jarts. Most of the trees and shrubs are bare, so winter, yes. The guy is throwing something fairly small, maybe they used commons bagels. I remember F. Barry Dunning coming into my freshman physics lecture with a commons bagel. He started explaining about a betatron (BEE-ta) particle accelerator and how the bagel was similar to that. It was a torus, but unfortunately not evacuated and without magnets. It did, however, seem to be made of ceramic. Baker College and Frisbee. The lefty appears to be a righty throwing a frisbee. Good form.